Hi All--Elvis Lives.........what more could possibly be said that would have such profound meaning?........Well, I could offer a little detail on how he has been doing in our garden since being reincarnated here in 2002. Just like before, Elvis is acting like putting on size isn't going to be much of a problem. In 2002 it was 17x8 and then went 26x9, 33x13, 39x17, 46x22, and 50x21. Zilis lists it at 40x18 but reaching all the way up to 72x25. Growing in a spot that gets several hours of afternoon sun, it will take more time will to tell on the mature size. The photos are from 2002, 2004 and 2007. DH is interested in Surfer Dude, which kinda looks like this. But Tony is only selling OS of that one, at $50! Maybe Elvis needs to live in my garden instead. This is lovely. It reminds me of 'Jade Cascade' which ademink listed as her favorite. It's available from Mason in NH for $14, a place that I long to visit as it's only about 2 hours from here. To my very untrained eye, it looks similar but guess it's more blue whereas Jade Cascade is green! I just love this one! The slightest breeze is caught by the ruffles making the plant shimmy & shake! A very vigorous grower and keeps its blue all year. I had no idea it would get so big...my Elvis Lives #1 is growing like crazy and is crowding and about to surpass a S&S right next to it that is a year older! Elvis Lives. I bought the hosta for the name. I'm pretty sure that this hosta will still be here, and growing, long after I've gone on to the great rock'n'roll party in the sky. Mine, too, is crowding out neighbors. Oh, and I do have some pods on my EL this year. VT...there are some major differences between Elivs Lives and Jade Cascade. 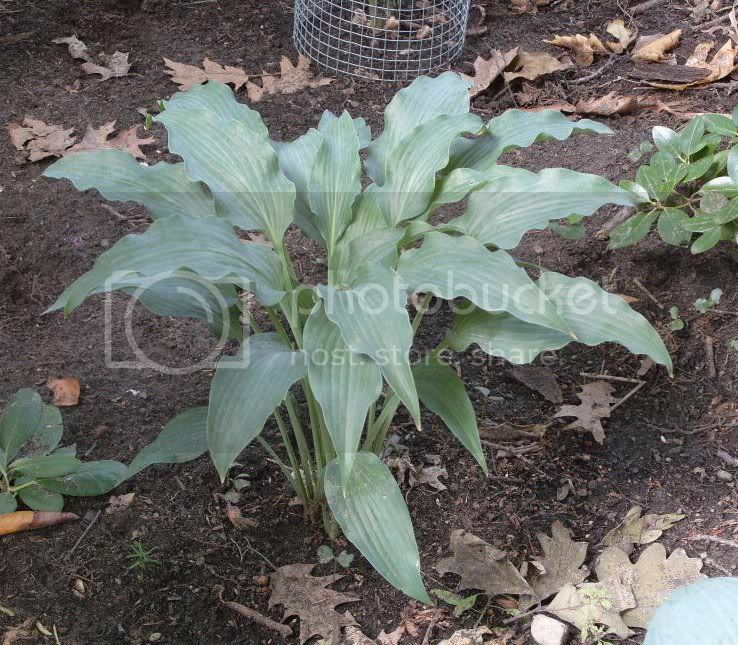 JC is a VERY tall hosta, and the leaves are much longer and larger. I like both of them very much. I'll see if I can find a pic and do a comparison on another thread. Elvis Lives is looking the best it ever has. The Mr Blue in front of it is about half its normal size. The Paradise Red Delight to the right is a slug magnet. My wrens are not doing a very good job this season. Elvis Lives is looking very good today. That's Raspberry Sorbet on the right and Mr Blue up front with Paradise Red Delight in the top right.